morning can be a difficult time, trying to eat breakfast, get dressed, get the kids dressed and get out the door. As many parents know the morning can be a difficult time, trying to eat breakfast, get dressed, get the kids dressed and get out the door. But instead of running away from the chaos, Ryman Stationery is offering solutions to take control back and get your kids out the door on time. By organising your time efficiently, you can make sure you have enough time for any potential disasters as well as your cup of morning coffee. It’s important not to rely on the smartphone as your morning alarm as it can lose power and may keep you up at night. So stick with a reliable alarm clock like the Acctim Vierra Silicone Alarm Clock (£14.99) with its soft-touch silicon and illuminate smartlite technology it will add a trendy addition to your bedroom. By organising your family, you will have more time in the morning. A great way to get on top of the family scheduling is to plan for the week. On a Sunday afternoon get everyone to go through their commitments and organise when homework needs to be in and where everyone needs to be after school. By creating a plan there will be a less chance of a surprise along the way. The Tallon School Year Organiser Mid-Year 2018-2019 (£4.99) is ideal for organising the kids. The key to getting out the door on time is saving those valuable minutes in the morning. By laying out not only your child’s school gear but your clothes in the morning, you will save you and your family time in the morning. 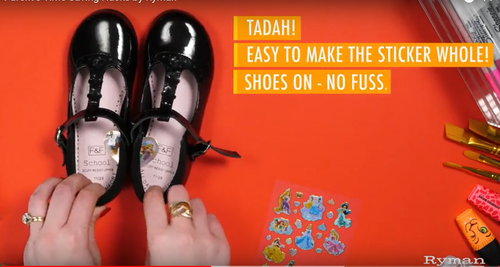 Another great tip to stop your child putting their shoes on the wrong feet, is to put a sticker cut in half in each shoe making it a game for the child to put the stickers together. The Tsum Tsum Rainbow Sticker Set (£1.49) would be ideal for creating this time saving morning hack. Preparing lunches the night before is another great way to save time and organise yourself and the kids in the morning. The Polar Gear Double Decker Lunch Box (£5.99) will ensure that lunches are kept fresh. Additionally, with the Thermos Intak Hydration Bottle(£5.99) you can save valuable minutes by creating drinks on the go for the kids. When the kids run in from school and start their homework, it’s easy for backpacks to be left empty. With pens, pencils and exercise books left all over the house, its clear see how the morning can become a panic of pulling together all the equipment for the day ahead. Make sure before you hit the hay that the kids backpacks full of all their school gear. Like the David and Goliath Unicorn and Cupcake Backpack (£19.99) is packed with everything they need for the next day. A clear pencil case like the Neon Tinted Clear Barrel Pencil Case (£3.29) is great for checking the kids have their rulers and colouring pencils for tomorrows art class. On those days your careful planning and organisation doesn’t work out, keeping emergency items in the car will put you and your family back on track. Put a storage box like the Really Useful Storage Box 18 Litre (£9.99) in the boot of your car and fill it with all those necessary items like a hair brush, emergency school tie, hair ties, and even a spare school jumper. Have a black Sharpie (£1.79) to colour in scuffs on shoes. Create a launch pod so you can ensure that everything has its place. The R White Desk Height WideCupboard 48cm with Overshelving (£399.99) is ideal for ensuring everything has a home. Store your bags, shoes, jackets and car keys and even school books. By having one location you save valuable time in the morning and feel positively organised. Prices correct at the time the press release was written. This press release was distributed by ResponseSource Press Release Wire on behalf of Ryman Stationery in the following categories: Children & Teenagers, Men's Interest, Women's Interest & Beauty, Education & Human Resources, Retail & Fashion, for more information visit https://pressreleasewire.responsesource.com/about.